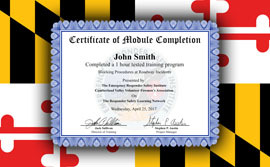 The Maryland Institute for Emergency Medical Services Systems (MIEMSS) has announced that it now accepts certificates of completion for online training modules from the Responder Safety Learning Network (RSLN) for continuing education (CEU) credit. MIEMSS is encouraging all Maryland EMS providers to take the critical roadway response safety training offered on RSLN and submit their completion certificates for CEUs. Providers can both take individual modules for credit and complete the full National Traffic Incident Management (TIM) Training Certificate for credit. RSLN modules are available to all providers at no charge. "We're thrilled to have MIEMSS on board," said Steve Austin, project manager for RSLN. "We are talking to a number of state and local organizations in fire rescue, law enforcement, and other roadway incident response agencies about accepting RSLN certificates for continuing education credit, and we are privileged to have an organization as prestigious as MIEMSS as one of the early adopters. This is going to improve the safety of EMS providers in Maryland and save lives." Maryland EMS providers just need to register with RSLN, complete modules, download their certificates, and email those certificates to MIEMSS at licensure-support@miemss.org with their name, EMS provider number, and the Con-Ed number for the modules completed. A list of MIEMSS Con-Ed numbers for RSLN modules can be downloaded here. RSLN offers more than 20 online training modules teaching roadway response safety practices and traffic incident management (TIM). In partnership with the Federal Highway Administration, RSLN also delivers a National TIM Training Certificate responders can earn by completing ten specific modules. And, later this year, RSLN will debut a new module of roadway incident response safety practices specifically for EMS providers. All training and certificates are free. To learn more about Respondersafety.com, visit the web site. Click on Learning Network to access the online training modules. To learn more about the National TIM Training Certificate from the Responder Safety Learning Network, please visit our information page. Respondersafety.com and The Responder Safety Learning Network are a project of the Emergency Responder Safety Institute, a Committee of the Cumberland Valley Volunteer Fireman's Association [link to CVVFA.org]. The Emergency Responder Safety Institute (ERSI) serves as an advisory group of public safety leaders and transportation experts committed to reducing deaths and injuries to America's emergency responders ERSI is dedicated to the safety of these men and women by engaging in and promoting activities that include developing educational material to support responder safety training; promoting the National Unified Goal (NUG) for Traffic Incident Management (TIM) including responder safety; safe, quick clearance and interoperable communications; encouraging the development of TIM Teams, promoting collaboration, communication and cooperation among the nation's emergency responders and keeping emergency responders up to date on national rules, regulations and trends related to safe roadway incident operations. The Maryland Emergency Medical Services System (MIEMSS) is a coordinated statewide network that includes volunteer and career EMS providers, medical and nursing personnel, communications, transportation systems, trauma and specialty care centers and emergency departments. MIEMSS oversees and coordinates all components of the statewide EMS system in accordance with Maryland statute and regulation. This includes planning, operations, evaluation, and research. In addition, MIEMSS provides leadership and medical direction, conducts and supports EMS educational programs, operates and maintains a statewide communications system, designates trauma and specialty centers, licenses and regulates commercial ambulance services, and participates in EMS-related public education and prevention programs.